TS affects approximately 1 out of every 2,500 female live births worldwide. It embraces a broad spectrum of features, from major heart defects to minor cosmetic issues. Some individuals with Turner syndrome may have only a few features, while others may have many. Almost all individuals with Turner syndrome have short stature. This is partially due to the loss of one copy of the SHOX gene on the X-chromosome. This particular gene is important for long bone growth. Linear growth is attenuated in utero, and statural growth lags during childhood and adolescence, resulting in adult heights of 143-145 cm (approximately 4 feet 8 inches). 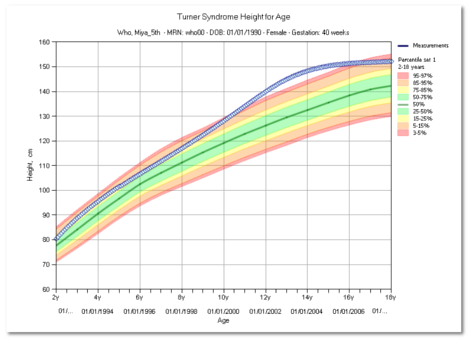 Final adult height in Turner syndrome can be increased by a several inches if growth hormone (GH) treatment is given relatively early in childhood.